Definition at line 81 of file fst-decl.h. Definition at line 34 of file mutable-fst.h. Definition at line 35 of file mutable-fst.h. Definition at line 36 of file mutable-fst.h. 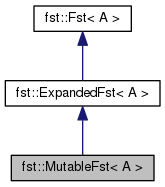 Implemented in fst::ImplToMutableFst< internal::EditFstImpl< A, WrappedFstT, MutableFstT > >, and fst::ImplToMutableFst< internal::VectorFstImpl< S > >. Reimplemented in fst::ImplToMutableFst< internal::EditFstImpl< A, WrappedFstT, MutableFstT > >, and fst::ImplToMutableFst< internal::VectorFstImpl< S > >. Definition at line 61 of file mutable-fst.h. Implemented in fst::EditFst< A, WrappedFstT, MutableFstT >, fst::VectorFst< A, S >, fst::VectorFst< fst::ReverseArc >, fst::VectorFst< fst::ArcTpl >, and fst::VectorFst< Arc >. Implemented in fst::ImplToFst< internal::VectorFstImpl< S >, MutableFst< typename internal::VectorFstImpl< S >::Arc > >, fst::ImplToFst< internal::EditFstImpl< A, WrappedFstT, MutableFstT >, MutableFst< typename internal::EditFstImpl< A, WrappedFstT, MutableFstT >::Arc > >, fst::ImplToMutableFst< internal::EditFstImpl< A, WrappedFstT, MutableFstT > >, and fst::ImplToMutableFst< internal::VectorFstImpl< S > >. Definition at line 40 of file mutable-fst.h. Definition at line 103 of file mutable-fst.h. const string & convert_type = "vector"
Definition at line 132 of file mutable-fst.h. Definition at line 79 of file mutable-fst.h. Definition at line 76 of file mutable-fst.h.